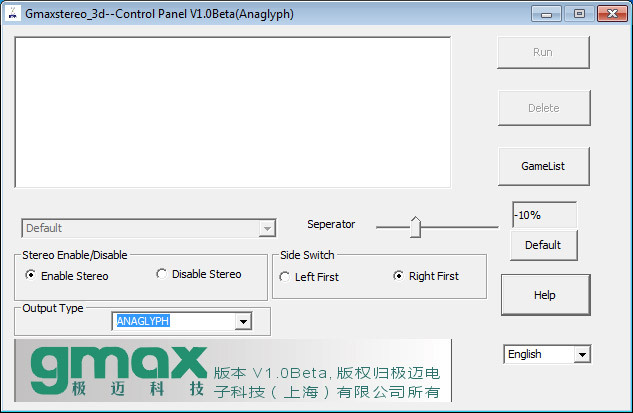 Here is something interesting that I’ve just found, a stereoscopic 3D driver for playing games in stereo 3D mode being developed by a Chinese company called GMAX Electronic Technology. Of course the software is far from perfect or from the level of features and support that more well known solutions such as Nvidia’s 3D Vision or DDD’s TriDef 3D are, but it is still interesting as an alternative. The Gmax stereoscopic 3D driver apparently works with all GPUs and supports Anaglyph and Side by Side output modes. The free version of the software supports only anaglyph mode and puts a watermark on the screen, but that shouldn’t be a problem for testing it. The product also uses profiles for games and currently the developer reports that there are profiles for 273 games available and of course there is a generic mode that you can use for games without profiles. And now with the not so good things about the Gmax stereoscopic 3D driver. Although the installer and the interface of the software is translated in English, the error messages and the help remain only in Chinese and that could be a bit of a problem while installing the software. I’ve had some trouble installing the software and making it work at first, but after that it worked quite Ok. You only have a slider for adjusting the level of depth, nothing for the convergence and in order to enable/disable the stereoscopic 3D effect or to change the depth level apparently you need to get out of the game do the changes and rung it again – no real-time adjustment. The good thing is that the games are being launched via a Launcher software, similar to TriDef 3D Ignition and you have the ability to switch the left/right image, but again only prior running the game. If you ate interested you can give the software a try and report your feedback below, it definitely has the potential to be developed further into something good, but there is some more work to be done (the software is also labeled as Beta). Interestingly enough there is also a mention about stereoscopic 3D driver for Linux as well, though there isn’t much information about it available.